Synopsis [c/o Barnes & Noble]: "The pushcarts have declared war! New York City's streets are clogged with huge, rude trucks that park where they want, hold up traffic, and bulldoze into anything that gets in their way. The pushcart peddlers are determined to get rid of them. But the trucks are just as determined to get rid of the pushcarts, and the result is chaos. The pushcarts have come up with a brilliant strategy that will surely let the hot air out of their enemies. The secret weapon-a peashooter armed with a pin. The target-the vulnerable truck tires. Once the source of the flat tires is discovered, the children of the city joyfully join in with their own pin peashooters. The pushcarts have won one battle, but can they win the war? The outbreak of a war between truck drivers and pushcart peddlers brings the mounting problems of traffic to the attention of both the city of New York and the world." Overview: I know I don't have kids, and I know that this blog is read by adults. [Well, I hope it is anyway. If it isn't, then I need to start watching my language.] Despite this, I figured I could do just one cover of a children's book because it's one of my all time favorites, especially while I was growing up. I don't remember the first time I read it, but I was probably somewhere between the third and fifth grade. I do remember loving it so much that I reread it dozens of times, fascinated by the idea that something that is potentially so weak could stand up to a bully. Every child's dream is to be the hero, right? 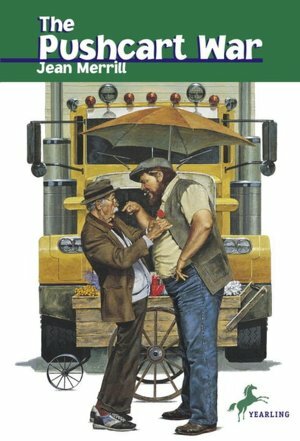 In this book, the hero is an unlikely lot of pushcart owners; you know, the pretzel, hotdog, or roasted peanut carts that line the sidewalks of large cities. Turns out, the semi-truck drivers have started to cross boundaries and overtake their turf. Usually the bullies would be allowed to get away with their behavior, but not this time. The pushcart owners have taken matters into their own hands with peashooters, an idea that spreads chaos and havoc among the truck drivers. Who wins the war? Read the book and find out. Aww, cute, I've never heard of this one and I've consider myself a big reader since I was 5. :) I even took a few children's lit classes in college. Anyhow, I always loved Caddie Woodlawn. I read it in 2nd grade and always remember it fondly. (From amazon: Caddie Woodlawn is a real adventurer. She'd rather hunt than sew and plow than bake, and tries to beat her brother's dares every chance she gets. Caddie is friends with Indians, who scare most of the neighbors -- neighbors who, like her mother and sisters, don't understand her at all.